From staying on top (and ahead!) 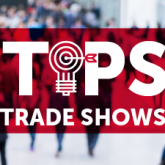 of talent management trends, to the latest advancements in recruiting—the benefits of attending trade shows are endless. However, without proper planning, the likeliness of a successful HR trade show experience can decrease significantly. Lucky for you, we’ve done the research, applied various strategies, learned from our mistakes, and gained valuable insights. Today, we have a renowned record of successfully participating in human resource trade shows and events, but enough about us. With HR Tech around the corner, here are 7 best tips to make YOUR next HR trade show attendance a productive one because well, time is valuable. Before pre-registering for that next big trade show, schedule a meeting with your team, all hiring managers, and any relevant company stakeholders. Together, discuss the important key challenges, questions you’d like answered, and planning for next year tied to your talent acquisition strategies. Based on the challenges, come up with realistic goals to help ensure that your company stays ahead of the curve when it comes to attracting talent. Align your goals with both the exhibitors attending each trade show and the seminars being presented. What do we mean? First, outline the exhibitors and seminars you’d like to visit and map out exactly when you will be able to do so. Remember that to be successful with this, you will need to be strategic. Therefore, review the floor plan (if one is accessible) and allow time to move from one exhibit or seminar, to the next. Also, when considering which seminars to attend look for those whose themes coincide with your business needs (Hint: these should have been defined during your team meeting in Tip #1). Your road map seems complete, but until every minute is accounted for, is it? Devise a plan to take advantage of lunch hours and after hour events too as both of these are often overlooked opportunities to network with other professionals! If one of your determined goals (from Tip#1) is to find state-of-the-art talent acquisition software that fits your needs, then prepare ahead of time. Build a list of what you want in a provider before you meet with any providers. Why? Because you might get lost in everything else the provider has to offer that you could easily forget what you and your company really needs in its TA software. For instance, if you are looking for a TA software provider and both, ease of use and great customer service are important to your company then you better ensure that ease of use and great customer service are important to the provider as well. Have your roadmap (Tip #2) and list of must haves (Tip #3) easily accessible whether that be printed out or stored on your phone. There are many gimmicks that could distract you during the show and this will help you from veering off your intended route or list. To keep your energy up throughout the show we recommend bringing quick snacks with you. When talking with vendors on the exhibit floor it’s important to ask hard questions, like, are they financially stable? Knowing this information could provide you with confidence that they will be around for the long haul, or that their future is unclear. If the latter, then using their services could be a huge financial risk for your company. Another question that you should never hesitate to ask is, how do they treat their customers? If the vendor cannot give quality real-life situations, then you can probably assume that they are not providing their customers with a top notch experience. Lastly, we recommend smiling and introducing yourself. You never get a second chance to make a first impression and you just never know what you might learn that could benefit your company, or career. Remember, it’s great to have a plan to follow, but sometimes things change that are simply out of our control. For example, trade shows often share an updated guide when you arrive. If this happens, take some time to revise your plan, if needed. Once you have made new connections, whether that be a speaker who led a seminar or someone you met in that session, keep in touch and continue the conversation. Make a point to schedule both informal and formal meet-ups in the near future to further your relationship. We recommend scheduling time with the top software providers you met to get a deeper understanding of what they have to offer and if their offerings connect positively with both your companies needs, and wants. Remember, even before you decide to attend a trade show, you’ll need to plan ahead. And to get the most from attending a trade show, you should always have a strategy in place. Having a plan that maps out exactly what you would like to accomplish before, during, and after the trade show will help stay organized and relaxed. By following our 7 tips you’ll make the most of your time, resulting in a productive trade show.